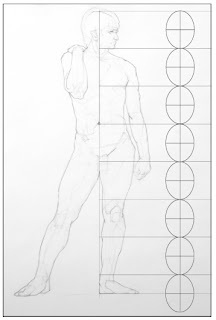 I thought I would write about proportions of the human figure and introduce to you a system that I was taught in school. 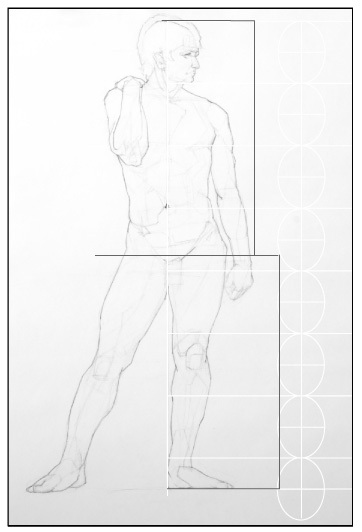 This is a set of guides used to create proper proportions relative to the head size. That is, we measure the figure in heads lengths. 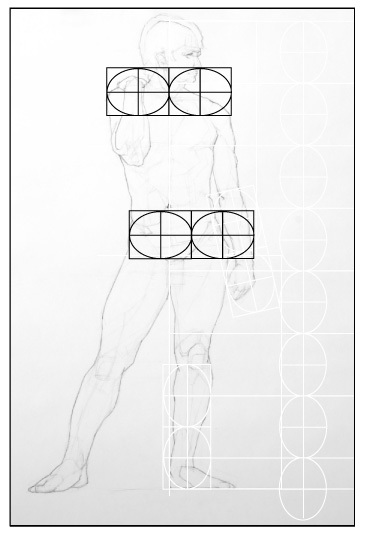 For this post I am using a 7 and 1/2 head tall figure for the proportional measurements. You may see elsewhere guides measuring the figure as 8 heads tall. 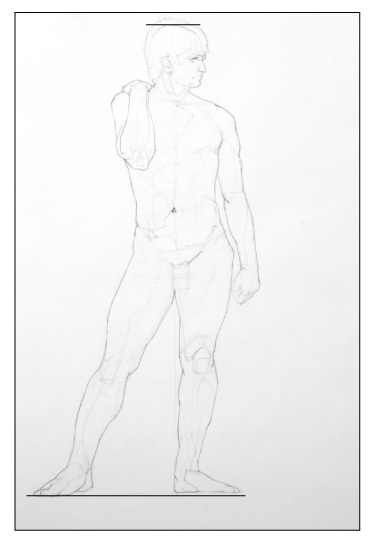 Don't let this confuse you, both are just slightly different approaches to resolving the same problem, which is how do I make sure all the parts of the body proportionally relate to each other and to the figure as a whole. The answer is that artists came up with was to measure the parts of the figure against the height of the head as a standard of measurement. In this case the body will be seven and a half heads tall and everything will fit as it compares to the height of the head. One note before I go on, the seven and a half head tall body is just a guide. Not everybody measures exactly seven and a half heads tall. That is because the size of the head remains roughly the same from person to person, but the height of a person can vary dramatically. This means a head to height ratio will be slightly different for everybody. At my height, I do not measure to be seven and a half heads tall. With that being said, having some sort of understanding of a proportional system to use as a guide makes learning about the seven and a half head proportional measurement and good starting point. 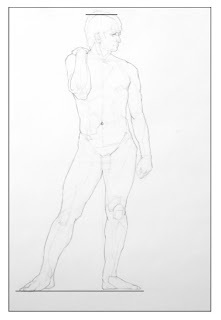 You can see that, to the right, I have drawn a male figure using line to represent all the surface planes of the body I could see. 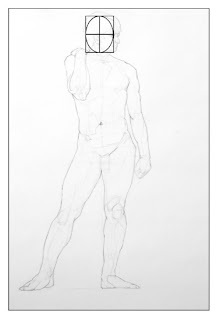 Usually, I will measure the relative proportions against the model by holding my pencil up between me and the model to measure the relative head size as it from where I am sitting, then I do the same thing to see how the parts relate, using his head size as a guide. This time, I have drawn this figure to be seven and a half heads tall. 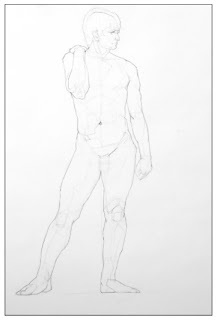 To do this, you first determine the size you want the figure to be in your drawing. Next, find the length or height of the head. 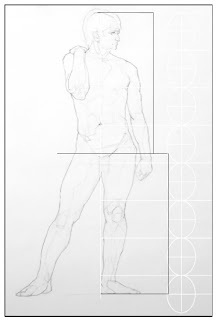 This will be your reference point for the proportions with the figure. The measurement does not include the hair. The length of the head is from the top of the skull line to the bottom of the chin. To the right, you can see the measurement overlaid on top of the drawing. In your drawing you will want to make sure that the height of the head is less than a seventh of the overall height of the body. You will want to fit seven and one half heads between the top an bottom marks you previously made. 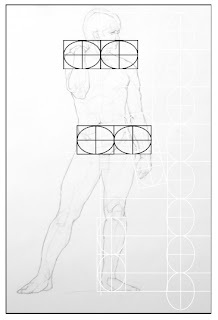 In this next image, I have overlaid on top of the drawing eight ellipses representing one head height to determine if the figure in this drawing is at seven an a half heads tall. To see if your head size is proportional to the figure size estimate the head size then mark lightly on the page the head lengths down the length of the figure. If the figure is seven an a half heads tall you have a good measurement, if not adjust the measurement and do it again until you get the desired proportion. I recommend you try this without using a ruler to measure. Practice estimating the head size against the figure. This is one of the first steps in learning to evaluate proportion. Next, find the center line of the height of the body. To do this, just divide the total figure height in half and you will get the measurement of 3 and 3/4 heads tall. This is where the center line of the body lies. As just a little side note, the center line of the body is at the upper part of the of leg bone called the femur. It is at the part of the bone called the greater trochanter. 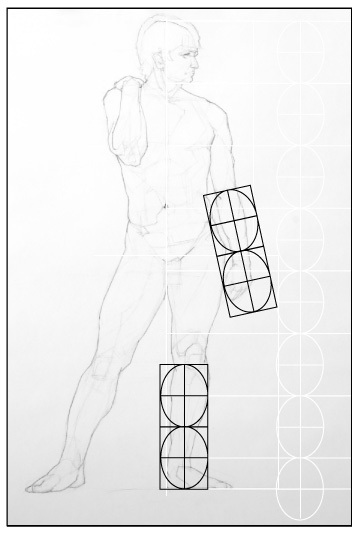 Using this system, the parts of the figure have standard measurements, such as the length of the forearm and hand measures 2 heads long from figure tips to elbow. By the way, a hand is three quarters of a head long. This makes the forearm one and a quarter heads long. The foot and lower leg also measure 2 heads high, from the bottom of the foot to the knee. 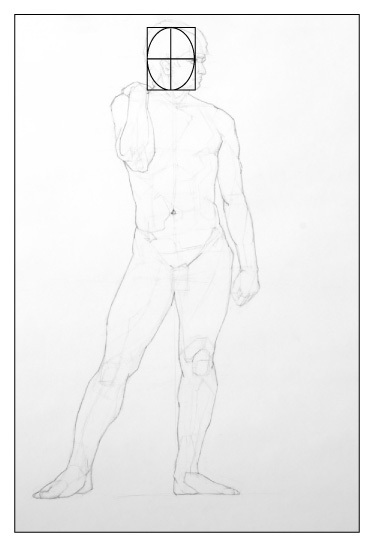 In this guide, the shoulders on a male are usually 2 heads wide, and the hips are about 1 an 1/2 head lengths wide. For the female figure, these numbers are reversed and the shoulders are usually 1 and 1/2 head lengths wide and the hips generally measure 2 head lengths wide. Remember, this is just a guide and not everyone will fit these proportions exactly. People vary in size and shape and you will want to deviate from these guides for a variety of reasons. 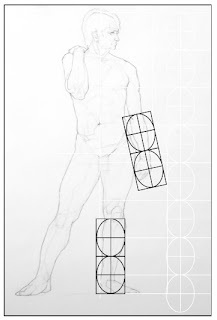 Still, you can use this information as a guide to keep the parts of the figure in proportion to each other as you draw. 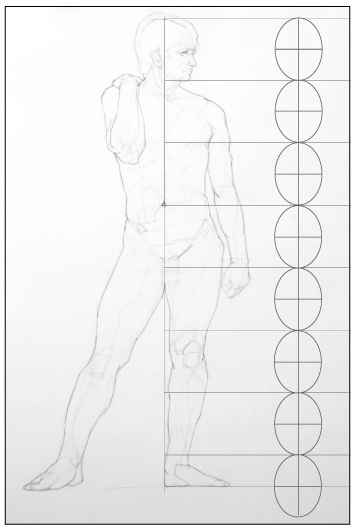 This is just a brief introduction to proportion using a a proportion system that measures the figure at seven and a half heads tall. Different proportional sizes may be called on for a variety of reasons. Fashion illustration and super hero comic illustration are examples of using different proportional standards to stylize the figure drawn to meet the artists needs. The figure is further divided and measured as its size relates to the head size. I will post more on this later. 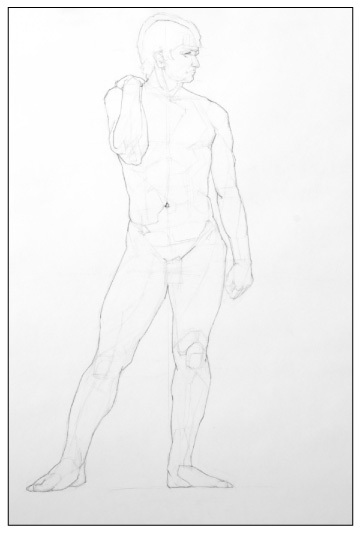 Try practicing drawing a figure to these proportions, this will help you learn to gage the relative size or proportion of the figure as parts relate to each other and the figure overall.